Kulbhushan Jadhav’s mother and wife were made to look like widow, said our external affairs Minister, Sushma Swaraj in parliament. She added that the Pakistani authorities actually asked them to remove their Mangalsutra, bindi and Saree and wear simple salwar kameej, before meeting Jadhav in the Jail. It is humiliating, she said, forcing the married woman to look like widow. Many Parliamentarians were equally shocked. We would like to say here that we are disgusted with such PR exercises by both the governments in this case which has now grabbed international headlines without really making any headway in the right direction. Pakistani authorities were using their ‘faithful’ media to look more liberal in allowing the mother and wife duo to meet a convict who has allegedly accepted committing crime according to Pakistani law. The matter is also in the International Court of Justice but more than that it has become a kind of war of words and perception between the two nations. The media on both the side of the border has become absolutely farcical and a complete joke playing with sentiments of their respective countrymen and cooking up stories. Both India and Pakistan has been indulged in this perception building exercise for years. As far as India is concerned, it is complete failure of foreign policy and need to be seriously introspected. We definitely would like both India and Pakistan to allow their prisoners to meet their families as well as provide them full legal aid. There are hundreds of innocent citizens languishing in the jails of both the countries and a special court should be formed in both the countries to look after the cases and their nature. Except for the very serious crimes, all other people should be released as good will gesture. Both India and Pakistan need to live accepting the realities of time. India and Pakistan will never grow and will allow the western powers to maneuver in the subcontinent if they continue to fight idiotically. There is no need to dig up history now. Pakistan is a reality and so is India and blame game must stop. Supporting terrorism of any kind on Indian soil must be stopped. Pakistan must rein in on the Islamic Jihadis who give open call of violence against India and its vast population. Kashmir and Islam are the pet projects in Pakistan to instigate people and their Sanghi counterparts in India are only engaged in similar exercise which is unable to counter Pakistan diplomatically but only using it to activists, writers, dissenters and peaceniks to strengthen their poll prospectus by polarizing the people which threaten the very integrity and communal harmony of the country. Treatment to Kulbhushan Jadhav is a matter of concern in the very similar way as we treat many of the Pakistani prisoners. We can only suggest to the government that they should make every effort to get Kulbhushan released but that would only be possible when the government allow the diplomacy to do its task independently and not use the material to appease their domestic constituency. Diplomacy is not the street tutu main main that we have most of the time but a serious issue to protect our national interests. So nothing wrong for the government to do its best to get Kulbhushan out but so far it has failed miserably. The saddest part of the government’s policy failure was to make this issue look similar as the Pakistani did as a PR exercise for their domestic constituency. Government of India might have realized it later that Pakistanis are equally expert in doing these theatrics as we are doing after all we hail from the same family not more than 70 years back. They shamelessly asked the mother and wife of Kulbhushan to put off their religious signs of Bindi, chappals and Mangalsutra in the name of ‘security concern’. I am not sure how wearing Bindi or Mangalsutra become a security threat for the Pakistanis. Unfortunately, the way SushmaSwaraj referred to the issue in Parliament made it more theatric like the Pakistanis. ‘ It is sad that the Pakistan authorities forced the wife and mother of KulbhushanJadhav to appear before him as widow’. Now this is a serious and very disturbing statement by a Minister who is considered to be very articulate and speak measuredly. How does not wearing a Mangal Sutra and Bindi make a woman widow or look like her. What does Sushamaji want widows to look like. Wear the white and don’t do any make up, don’t smile, don’t keep happy. It is sad that SushmaSwaraj has lifelong promoted those filthy brahmanical ideals against which all Indians should struggle and fight. Do widows have right to life and live with dignity or not. But then those who know SushmaSwaraj and her antics would remember what she threatened to do when UPA-1 came to power in 2004 and Sonia Gandhi , in all, likelihood was to become the Prime Minister of India. Sushma threatened to tonsure her head and live ‘like’ a widow. In fact, I wrote an article that time too castigating Sushma. I have seen my mother living a life of a widow for long. Smile from her face had gone off and she lived an extraordinarily simple life. She would sit on the floor even if young boys of our age would come to home. She tried to be away from all the make ups and other things. We know and have seen in many parts of Poorvanchal that widows cant even perform Kanyadaan of her daughter in the marriage ceremony and are kept away from all the auspicious occasions. Life of ‘widowhood’ according to brahmanical traditions is a curse and Sushmaji must have known it. Rather than condemning such codes of conduct that Gita Press Gorakhpur made so popular that the life of a widow in a traditional Hindu society became curse. It is that curse and miseries attached to the lives of widow that forced people to commit Sati or murder their widows for the fear of living a life of hell. We know these are the times when Sushmaji’s atrocious statement would not attract any criticism by media or even the feminists and human rights defenders. We have not seen any statement so far on their part as why Sushma Swaraj bring these issues into picture and why she has so much of fascination for widows look like recluse, dejected and totally isolated. The fact and dirty reality is that what Sushma Swaraj said was a reality of our lives. 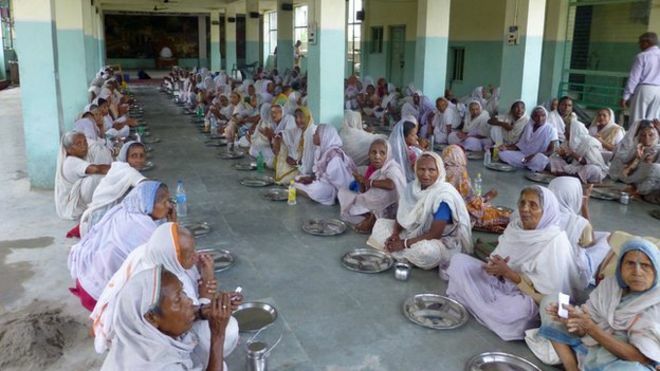 Thousands of widows are forced to live in horrific conditions in many of the ‘holy’ places including Brindavan and Varansi. I have seen them from close quarters. These days,brahmanical ideologues are providing them ‘freedom’ such as ‘allowing’ them to play holy and put colour on each other’s face while the other one want them to put sindoor over their head in the name of looking good. Looking good and attractive is no issue for any one as it is individual choice. Sindoor and Mangal Sutra never protected women and are actually symbol of their slavery. Why should women’s life be guided by those symbols which take her right to choice particularly in relation to food habits, wearing cloths and even opting for a partner or remarriage which years ago Jyoti Ba Phule, SavitriBaiPhule, Baba SahebAmbedkar, Periyar and Ram Mohan Roy actually supported, encouraged and promoted when all of them talked about widow remarriages as well as education for all women. If Sindoor and Mangalsutra are sign of married women then why are they taken away from them if their husbands passaway? It indicate thatSushmaji, want women to be happy only when husband is around and then lead a life of recluse and dejection once he is no more. Is this the idea where the Hindu right make marriage laws so rigid that no woman would ever dare to go for a remarriage even if she wishes to because ‘widowhood’ cant be a permanent condition to live in. The condition of widows all over the country is terrible because of various taboos attached to them. Social environment need to be developed where remarriages must be encouraged and even if they don’t wish to enter into marital relationship, they must be allowed to live in happiness on their own. But if a Minister and that too a woman minister fancy widow living with tonsure head, sleeping on floor, eating spice less food and wearing colorless cloths lifelong then she need to change her attitude. She could become a big ambassador towards the rights of widows when on the Teej day she can make a beginning by asking women who have lost their husbands to be part of the celebrations. The violence against women and girls does not happen all of a sudden. It is because of the social environ that has been created by the feudal brahmanical order which is being glorified day and night by the Sangh Parivar and its ideologues. They are worried about Muslim women and want to fill the Indian jails with more Muslim men now in the name of triple talaq but there is no interest, no demand by these champions of Hinduism to make their atrocious value system more equitable towards women where they can live with dignity. Will they bring a law where husbands leave their wives without giving them a divorce? Will they bring laws where widows, single women are not harassed because of their status and if they are not positive to someone, do not face character assassination, being Dayan, witch or kulta which happens everywhere. Most of the cases of witchcraft are committed on women who are either widows or single and face the wrath of the society. There are no laws for the protection of these women in our society. Manusmriti has been the worst code book as far as women and shudras are concern but the SanghParivar and its various offshoots glorify it. We don’t know whether they glorify Manu’s law or miseries of women so that their feudal den is safe and protected. We hope Sushmaji and her other colleagues in the Ministry will seriously introspect and not make such statement that further isolate women who have lost their husbands. Making widowhood a permanent position is to ensure that women live in desperate and helpless circumstances blaming themselves for the wrongs that happened to their husbands without ever thinking or even imagining of another person in their lives. We don’t say that they must do it but that option should be with the women and even if you don’t want to suggest such things saying that the woman loved her husband too much, why do such code to live a life of recluse after losing their husbands. Should women not contribute to nation building or do they lose right to citizenship or their capacities to govern or lead once they become widow? I hope she has not forgotten that Indira Gandhi was one of the most powerful prime ministers of the country, a leader which people still remember as prime minister even today in Modi era in many parts of India. Hope the intellectuals of SanghParivar will look into these aspects and provide ideas to the government. In the meanwhile, we can say no government in the world would be able to serve their citizens if they are guided and surrounded by the religious fanatics whether in India, Pakistan or any other country. Constitutional values must uphold dignity of individuals and equal opportunities to all which the religious laws have never granted. Political governments can’t impose religious values and therefore we expect government to think about these issues. Will Sushmaji ever learnt that her theatrics damages the cause of women in India particularly those who lose their husband and want to live life in dignity and contribute towards making our society better and humane. Baba SahebAmbedkar developed Hindu Code Bill in the greater interest of the Hindu women which gave her right to divorce and right in property too and was thoroughly opposed by the Bharatiya Jan Sangh and the Hindutva ideologues like Shayama Prasad Mukherjee as well as many conservative elements in the Congress party including the then president DrRajendra Prasad. Will the government promote widow remarriages and their honorable rehabilitation so that they too can feel part of our life and share their happiness and sorrows like any other citizen so that they are not compelled to live life in dejection in various bhajanashrams of Brindavan and Varanasi ? May be, Sushmaji can start the process.